Given the cost of energy, the choice of household appliances with a small consumption of electricity, water, can significantly save the budget. Below is an example of induced labels indicating energy efficiency for the washing machine in EU countries. In force since 2010. As for 2015 is considered a new edition of the label but at the end of 2015 has not been approved. The label displays the flag of the country for which the released this washing machine, in this case for the European Union. In other countries outside the EU flag placed the country although it is not up to standard. Below is the manufacturer of the washing machine and labeling of the product (model). Then specify the existing classes of energy efficiency, and on the right with black class of the model. 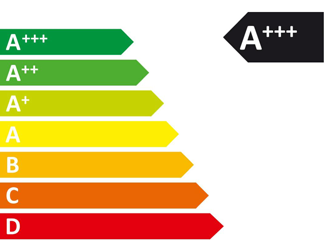 Energy efficiency is determined by laboratory tests on the following criteria. How much energy is spent on washing at full and half load at a temperature of 60 ° C and 40 ° C wash in a year, a year made 220 wash cycles, as well as in standby mode. Formula bulky and they are not necessary to the consumer. Briefly approved by EU directives set how much should be consumed washing machine energy tests established how much energy is spent on the model. EEI=(specific energy consumption model of the washing machine) / (at the cost approved by the European Union) x100. The ratio of energy consumption washing machine from the standard calculation of the percentage is EEI. Estimated average annual electricity consumption is calculated based on 220 washing cycles per year, 94 cycles at full load and at a temperature of 60 ° C, 63 cycles at half load and wash temperature of 60 ° C, 63 cycles at half load and wash temperature 40 ° C. The indicator is very conditional because in reality may differ by 30-40% on the specific conditions of use and the temperature of the cold water in European countries, Standard cold water temperature of 15 ° C is adopted. Estimated water consumption, calculation performed again based on 220 cycles of washing cotton.It calculated correctly, but again does not give the full concept of how much is spent for the water in the wash cycle, or at half washing error of about 20%. Maximum loading washing machine dry linen in kilograms, cotton at a humidity of 30%. Class spin washing machine, showing how much moisture will remain in the cotton after pressing, the greater the momentum spin the less water will remain. The following table is the ratio of the number of class-pressed remainder of moisture in the clothes. The maximum noise emitted by a washing machine in the wash or rinse. Measuring device during operation of the washing machine may vary slightly in different washing machines of the same model, the main noise of the washing motor creates. The maximum noise emitted by the washing machine during the spin cycle, the main noise creates a drum during rotation and pump bilge water from the washing machine.